Disney’s animation studio seemed to be running out of creative steam when it announced in 2004 that it would be discontinuing hand-drawn animation in favor of computer-generated animation. Its subsequent efforts ( Chicken Little, Bolt) have failed to steal any thunder from in-house rival Pixar. Ironically it was John Lasseter, Mr. Pixar himself, who championed the studio’s return to hand-drawn films. The result is The Princess and the Frog — a predictable but fun fairy tale that harks back to the musical fairy tales from studio’s past. The story falls into a predictable groove, despite the new characters and settings. The journey is fun, and the heroine is a smart, self-reliant princess who appeals to modern viewers. Like many of Disney’s fairy tale movies, The Princess and the Frog starts with a storybook tale. Instead of castles and cabins in the woods, we get the antebellum mansions and shotgun shacks of an idealized New Orleans of the 1920s. Tiana (Anika Noni Rose), the movie’s black working-class heroine, dreams of opening a restaurant. She knows that wishing on a star can’t take the place of talent and hard work. Meanwhile, Prince Naveen of Maldonia (Bruno Campos, speaking with a vaguely French accent) arrives in town, hoping to find a wealthy bride. An unfortunate encounter with a voodoo magician turns the prince into a frog. A kiss from Tiana meant to restore him instead turns her into a frog. Then it’s off to the swamp, where the usual Disney elements make their appearances. The colorful animal sidekicks are a trumpet-playing alligator and a Cajun firefly. Instead of a good fairy, we get a blind voodoo priestess. At times it feels like the filmmakers had a checklist of things popularly associated with Louisiana and New Orleans: jazz, check; zydeco, check; rednecks, check; a creepy cemetery, check; Mardi Gras, check. The film’s intended audience likely doesn’t care about clichés and archetypes. Indeed, this grownup thought the movie was a fun romp. At 97 minutes, the story was concise and never lagged. 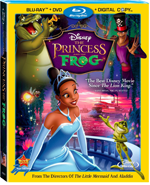 The Princess and the Frog is as enjoyable and fun to watch as any of Disney’s animated films of the 1990s. Though it earned a tidy sum at the box office ($267 million worldwide) and decent reviews, The Princess and the Frog was overshadowed by another animated film released at about the same time, Avatar. Apparently a nine-figure box office take isn’t good enough for the studio. Rumors have it that future hand-drawn animated projects have been delayed. Let’s hope that Lasseter can use his clout to get the studio to continue producing all kinds of animated movies. Co-directors John Musker and Ron Clements and producer Peter Del Vecho provide a lively commentary track, with Musker doing most of the talking. The three fill in many details about the film, leaving no awkward gaps. “Magic in the Bayou: The Making of a Princess,” is a 22-minute look at the making of the movie, with particular attention to the studio’s return to hand-drawn animation. Many animators who left the studio in 2004 came back to work on The Princess and the Frog. Six promotional videos that were originally released online fill in other details about the movie. There isn’t much information on these shorts that wasn’t in the 22-minute film. Musker and Clements are in two more extras. They introduce four deleted scenes — shown as a series of storyboard drawings with preliminary voice recordings — and explain why they were cut. “Bringing Life to Animation” focuses on the live-action reference footage that the animators used to envision animated sequences. “Princess Portraits” is a simple game that will appeal to younger viewers. A live-action music video of “Never Knew I Needed” by Ne-Yo is skippable. The film is available in a Blu-Ray three-disc combo pack, a single-disc Blu-Ray and a single-disc DVD. The three-disc pack includes a Blu-Ray disc with all of the above features, a standard DVD of the movie, and a digital copy of the film that allows you to copy it to iTunes or Windows Media Player. The picture and sound of the Blu-Ray are excellent. The sound is DTS 5.2 surround sound. The disc has French and Spanish audio tracks as well as subtitles in both languages. The movie is presented in the original 1.78:1 aspect ratio. A side-by-side comparison with the standard DVD shows that the Blu-ray has a sharper image, though the differences are subtle. After the little ones are done watching, check out the making-of documentary. Want to know more? Look at the live-action reference footage and deleted scenes. Disney animation buffs should save the commentary track for another viewing.